Pseudotropheus daktari is colorful mouthbrooder (is a mouthbrooder like a mouth breather?) native to Lake Malawi in Africa. It was reportedly collected near the southern end of the lake about ten to fifteen years ago. There is an article in the Cichlid Yearbook Volume 3 which contains a few details of the fish and where it was collected. Apparently "daktari" is the Swahili word for doctor, hence the name. 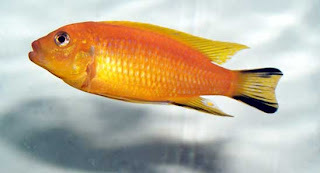 Pseudotropheus daktari is sure to be a popular fish. It is colorful hardy, adaptable and sexually dimorphic. Pseudotropheus daktari is no sea monkey thats for sure.